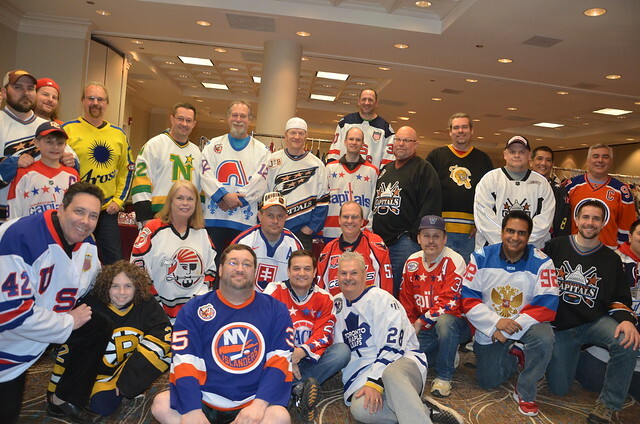 There were lots of cool vintage hockey jerseys on display at the 11th annual Northern Virginia Hockey Game Worn Jersey Expo at the Holiday Inn in Dulles on Saturday afternoon. The hotel hosted a game used hockey jersey expo and featured game worn jerseys and game used equipment dating back to the original six era. There were over 15 exhibitors including NHL jersey seller MeiGrey Group as well as vintage game worn jerseys from the “Original 6” era as well as the Capitals, Bruins, Islanders, Hershey Bears, Baltimore teams, and WHA teams. There were also game used sticks, game programs, hockey cards, and other memorabilia on display. Other people in attendance were approximately 20 of the top local jersey collectors displaying their collections. Among the highlights were Jeff Thompson and his array of Capitals jerseys from the inaugural season to the present. Scott Linn of ESPN 980 also had a nice rack including Alex Ovechkin memorabilia and media guides from different years. Derek Whitwer showed off his incredible WHA jersey collection. Francis Rady is the promoter of the show. He showed off his Boston Bruins collection. Tom Coleman had a pile of Baltimore Shipjacks jerseys as well as a selection of pucks, pennants and programs. Bert Woods had a nice display of jerseys for sale as well as Capitals memorabilia. Matt McConnell displayed college hockey jerseys. Scott Silvers had a table of New York Islanders memorabilia. Suny Sohi, Brian Gantman, and Harrison Lee all made their NoVa debuts with impressive displays. John Gerndt was the lone non-jersey exhibitor. He brought his collection of current and older hockey cards with a heavy emphasis on the Capitals. Mark Friedman showed off his vintage Caps collection. Alan Rindfleisch had jerseys, sticks and bobble heads for sale. This entry was posted in Collecting, Community, Memorabilia and tagged Game-Used Equipment, Jersey Collection, Memorabilia, Michael Marzzacco. Bookmark the permalink. Could you let me know the next time you have this event. I,m sorry I missed this one I would have loved to have been there.